A Simple French Toast. Who says you can't have french toast all day!!! 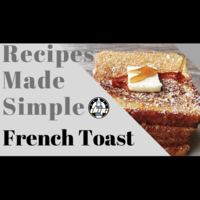 This recipe is the property of shakenvape007 and released under the CC Attribution-Noncommercial 4.0 license. You may not copy, derive or commercialize this recipe without following the terms of this license or the explicit permission of the creator.